One of the many privileges of being the Father of the New Order and Saviour of Highsec is that I have the pleasure of reading reports about progress and heroism taking place all across empire space. Meet Kalorned. He is one of many Agents of the New Order who forsook the comforts of home to pursue a life of Code enforcement in a faraway land. Kalorned found his calling in the distant, barbarous Gamis system, located in the Derelik region of the Ammatar Mandate. I first heard from Kalorned months ago. At the time, he was just settling into life in the unruly Gamis system. 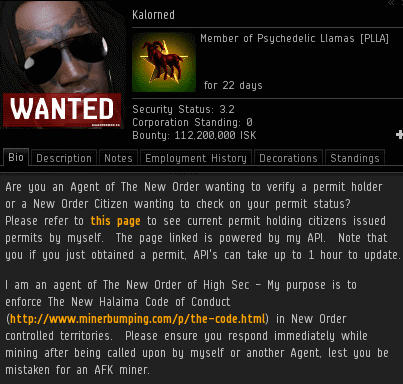 He often found himself being required to bump and gank miners, such as the Venture pilot described in this EVEmail. Those who live in the more civilized areas of highsec might gape at the crude, exotic customs of the carebears who live so far from the traditional New Order strongholds. "Who would willingly endure such trials?" they might ask. ...Because the miners of Gamis need the Code, too. That doesn't mean the natives will always be grateful, of course. They are inherently distrustful of outsiders--even the "outsiders" who rightfully own and govern highsec. Far removed from the well-trodden systems with familiar names like Halaima or Kamio, the miners of Gamis are often unfamiliar with the legal status of highsec. But as Kalorned proved over the past few months, wherever there is an Agent of the New Order, there is hope. 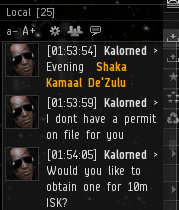 Kalorned recently reported an encounter with a swarthy young fellow named Shaka Kamaal De'Zulu, who was mining illegally in an ice anomaly. Shaka's unlicensed mining was done in the traditional manner of the outlaw carebear. But we in the New Order have a tradition of our own. When we see someone violating the Code, we bump them. With silent rage, Shaka returned to the ice anomaly in a Hurricane and began giving Kalorned the carebear stare. 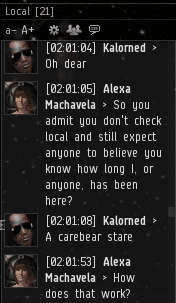 This must be a universal practice, deeply rooted in the unconscious carebear mind, because we see it all across highsec--even in the most isolated areas. Seized by a primal impulse, Shaka opened fire upon Kalorned's bumping vessel. Shaka was motivated, but the primitive tools at his disposal were no match for New Order technology. It was suicide. For the first time, Shaka spoke. It would be the beginning of a dialogue between carebear and Agent. Even Kalorned was shocked when he reviewed Shaka's Hurricane fittings. The Hurricane did not appear to be the product of a reasoned man, but of some wild beast. 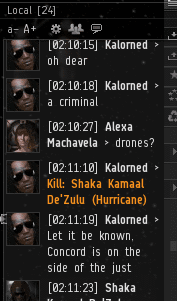 Troubled by the discovery, Kalorned remained steady in his belief that all EVE players have the potential to find a place in modern, civilized highsec. 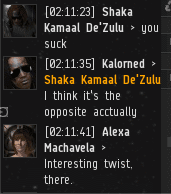 Could Kalorned reason with Shaka? Even though that 'Cane is an epic fail-fit, I'm impressed a carebear figured out how to disengage the safety and open fire. Sigh....what in the word possessed him to fit a 'Cane like that? Even if it were all light missiles, at least it'd be consistent. Probably a good idea to empty your cargo bay before PvP (or whatever that was) as well. Congrats to Kalorned! 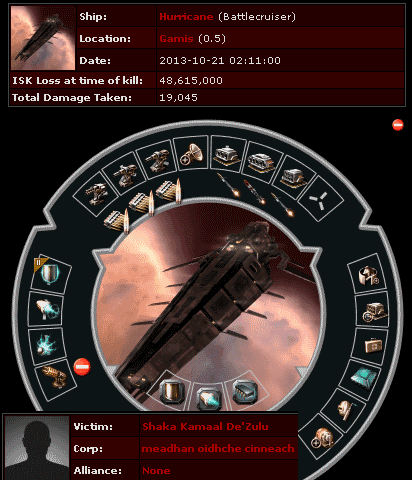 I'm really surprised the t2 shield booster wasn't able to tank CONCORD.... is probably what Shaka said later. It's good to see some of the less traveled areas of space receiving some well deserved attention from our agents. Funny but lame at the same time. Mixing high slots is always a good idea. I've had time to sleep on it and I've come up with the reason for the Hurricane fit that makes perfect sense. The pilot had heard about "kitchen sink" fleets. He was just one guy, so he knew he needed to cover all aspects of the "kitchen sink" so he put 1 of every type of module he had salvaged from missions onto the Hurricane. He's a real "army of one" type who should be saluted. After saluting, he should be taught how to fit ships. I am so thankful for my first corp.
Short and long range guns on the one ship is another great idea too. Kalorned is very friendly and willing to take time to teach you the ropes. It's good to see him get some recognition. Best thing to happen to Gamis. I have since moved to Null, but I wish you safe flying now and forever.